Hoping for a good fight between Mercedes & Ferrari tomorrow. If Kimi ever wants to win a race again, this is his best and possibly his last shot. Ferrari perhaps look to have the faster car so anything's possible. If Hamilton wins tomorrow, it will be 5 in a row at Austin, equalling Senna's record of 5 consecutive wins at the same circuit (Monaco 89 - 93) - Hamilton was on course to equal this at Silverstone. The two stopper could be a genuine option tommorrow. Especially with a track that will be quite 'green'. But if it's any of the front runners they should commit to it early if they decide to go down that route. It was a strategy that Verstappen used well last year, forcing Vettel into a compromised two stop strategy and overtaking Raikkonen for third (albeit illegally). Well at least Sebastian won't have Max to kick around tomorrow... or at least he shouldn't. OTOH it should be entertaining to watch Verstappen, Gasly, and Hartley charge up the grid. Can those new Honda power units push the Toro Rosso boys into the points? Last edited by Mort Canard on Sun Oct 21, 2018 1:21 am, edited 1 time in total. I was thinking more about why he didn't win. I thought you might be implying that, however with such a slim chance of winning the championship (Vettel essentially needs 4 perfect races) I don't think Ferrari are going to start deliberately taking Hamilton out to achieve it as the risk outweighs the reward, especially given what a spotlight it would be under. Also, Kimi isn't the sort of driver who would do that, let alone after being ditched. No I don't think that Kimi would do that deliberately but he also said he had nothing to lose, so he may ask the question of Hamilton? Kimi is too much of a gentleman and well liked by fans and the paddock. He would never Jeopardize his chances in a race specially after leaving Ferrari. Vettel also has thrown his gauntlet to the ground, saying that Hamilton is WC. Another mistake cost Vettel this weekend in practice effecting his grid position. Can someone remind me of the last time Raikkonen made a place on the first lap? Ferrari really need him to do that today. Abu Dhabi 2016 I believe. With softer tyres and superior straight line speed I can see Kimi taking the lead on the first lap today. Thanks I guess it depends which Kimi turns up. 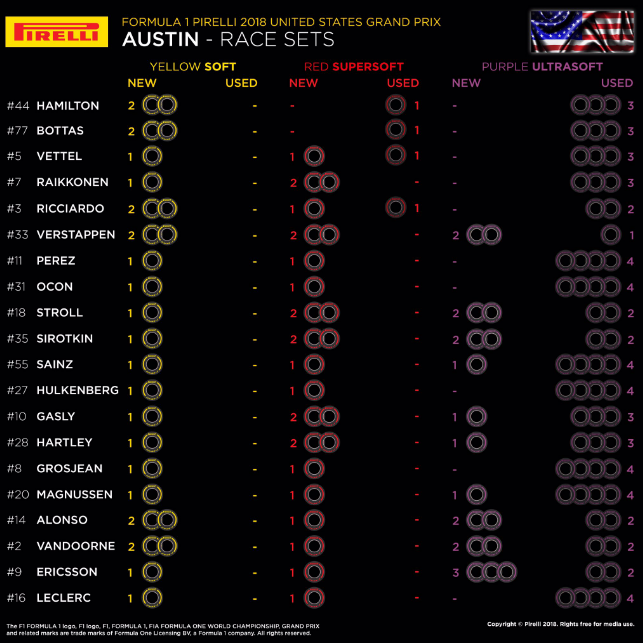 So how come Ferrari are suddenly quick again when they have left the upgrade they brought to Austin unused in the pits? I think its going to be a frantic first few laps. No point in playing safe anymore so I expect a few 'prangs', Max usually makes big strides early on Ric is in the mix and Ocon has a point to prove. I really cant wait for this one!! - Quickest: Initial stint on supersoft for 18-24 laps then soft to the finish. - Slightly slower: Start on ultrasoft for 14-20 laps then soft to the flag. - Slower: Start on ultrasoft for 20-25 laps then soft to the flag. They seem to be quick again on the straights. Basically, Hamilton has almost certainly beaten Vettel, likewise, Vettel has almost certainly beaten Bottas and Raikkonen, HOWEVER, Bottas is only 11 points ahead of Raikkonen. IF Ferrari had any sense they would back Raikkonen to the hilt to try and get him third place in the drivers' championship. I am guessing that when Lewis clinches, Toto et al will start pushing Valtteri up towards Sebastian. If Seb has a bad race today he becomes vulnerable as he is only 57 points up on Valtteri. Add to that the fact that Lewis often takes a bit of a mental holiday after he clinches and the fact that he probably figures he owes Valtteri a win and I see Bottas mounting an attack on Vettel in the standings. Whether it amounts to anything is another matter. Some of their upgrades since Singapore have actually hindered them somewhat rather than helped them. They have gone backwards to go forwards and it was worked. It may leave them wondering what might have been. 57 points is a heck of a lot and Bottas would in fact have to make up 58 as he cannot overtake Vettel's win tally. 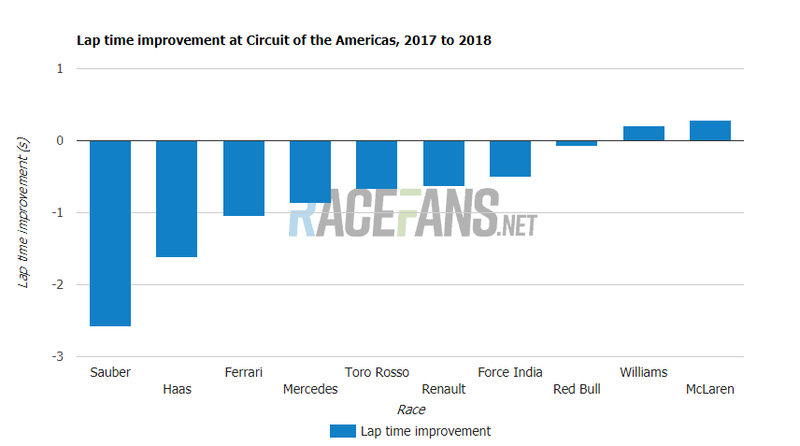 Given that Ferrari should be strong in Mexico and Brazil, it just seems mission impossible. For this race, Bottas being 3 tenths off of Hamilton is frustratingly predictible. If Ferrari are competitive in Qualy then Bottas always seems to be the last out of the red and silver quartet. Last edited by BMWSauber84 on Sun Oct 21, 2018 3:09 pm, edited 1 time in total. Revised limits issued by Pirelli require the teams to increase their rear tyre pressures for slick tyres from 20psi to 21.5psi. Verstappen will start from P18 after using a new gearbox. If Ferrari has the same advantage seen here on the straights in the race, there is no way Hamilton is keeping Kimi behind him, and I wouldn't be surprised if Vettel gets to the front by lap 10. I don't forsee Vettel doing anything dramatic to overtake like in Japan, because unlike Suzuka this is a track with gimme overtaking points. Is that something new from after yesterday's free practice and qualifying sessions ? IF so, how will the increase affect handling and wear on tyres ? IF the teams had known of this, would they have chosen their race tyres differently ? Vettel and Kimi sitting right behind Hamilton would have made for an interesting race. Vettel will need to get past Bottas quickly. The main reason for this is because Pirelli felt the teams didn't have enough time (only FP3) to give feedback for the PSI levels for rear tyres. This time around Bottas is 3 tenths down on the Ferrari's because the Ferrari is quicker, that's not a fault of Bottas as such. Apparently both Mercs have a problem with a water pump. At least in the Finnish broadcast they were showing that Valtteri's car was already fixed but they're still working on Lewis' car and it's unsure if the car will be ready on the grid. I haven't yet heard any tweets or anything about it though. Oooh, hopefully it spices things up. Between this and Ferrari looking mightily quick I don't think she's going to be performing this weekend. Hoping for a Kimi win but not sure if that will be possible with him starting on the Ultras, he could take the lead but clearly the SS is predicted to be the better strategy in the long run and unless Vettel can split the Mercs early on they'll be able to leave Bottas out and roadblock Kimi after he pits. Could all change if these water pump issues amount to anything I guess.